Nottinghamshire Police is set to run another seven-day knife amnesty as part of the national knife crime campaign Operation Sceptre. 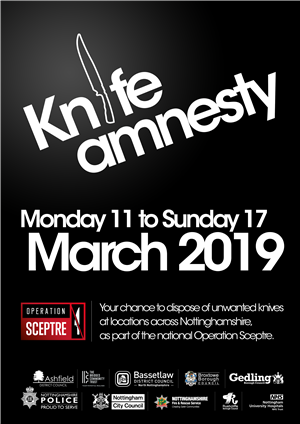 It starts today, Monday 11 March and runs until midnight on Sunday 17 March and will involve red knife amnesty bins being located at 15 police stations and partner agency receptions across Nottinghamshire. It follows the success of the last amnesty during September's Operation Sceptre, when 418 bladed weapons were taken off the streets of Nottinghamshire - which was 50% more in half the time of the previous amnesty in 2013. This time around we also have some new partners supporting us and showing that we are stronger when we work together. Nottingham University Hospitals NHS Trust will host an amnesty bin in the accident and emergency department at the Queen’s Medical Centre. There will also be a bin at the Bridges Community Trust in the Bridgeway Centre in The Meadows. These are great community locations and will hopefully help us in our aim to prevent knives falling into the hands of criminals.